During reserve-training in a sports hall, an increase in required deployment forces has been determined for several examples of this harness. In all cases the metal eyelet through which the splint loops pass on the reserve container was corroded (probably due to the influence of salty air). As a result of the corrosion, the loops were stiff and did not release on their own as designed from the eyelet once the splint had been removed. This in turn meant that deployment forces were increased. In agreement with the DHV the manufacturer Skyline Flight Gear GmbH issues the following safety advisory: All owners of the above named harness must check the release mechanism of the reserve container. In particular the metal eyelets through which the loops and splint pass must be carefully examined for signs of corrosion. In addition, the loops passing through these eyelets should be examined for signs of stiffening or swelling. These checks must be made before the next flight with the harness. 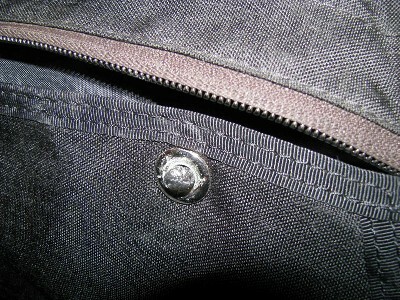 Picture: corroded metal eyelet with stiffened loop. In the event of corrosion, harness owners should contact the manufacturer without delay.